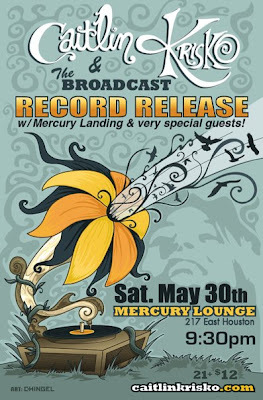 Quirky NY Chick: Caitlin Krisko & The Broadcast @ Mercury Lounge This Saturday! Caitlin Krisko & The Broadcast @ Mercury Lounge This Saturday! Caitlin Krisko & The Broadcast are playing Mercury Lounge this Saturday, May 30. This show will also serve as a record release party. The record, Over the Undercover, will be available at shows starting Saturday and from digital stores on June 15. I've heard the record; it's something to look forward to. And, swing by on Saturday if you're in the area.